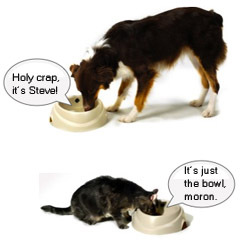 Although a dog bowl that plays back a recorded message for your dog may seem like a good idea at first, it really isn't. Sure, the "comforting your pet while you're away" angle is nice, but what about when you're home? Will Fido understand that no, you're not hiding near the dog bowl? Or will he spend hours searching your house, tearing apart your newly-purchased sheets and blankets in a costly game of hide-and-seek? If you're truly up for punishing your pets, the bowl costs twenty bucks and you can order online.